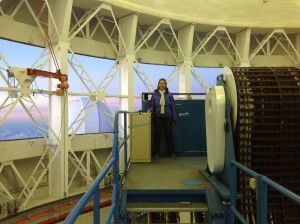 Me with the Keck and Subaru telescopes in the background. The clouds are pretty, but not great for observing! As a theorist (unlike many of my observing friends), I don’t make the trip to Mauna Kea or down to Chile to collect data for my research. I can work from the comfort of my office (during the day… mostly) right here in Santa Cruz! But as an astronomer, I very much rely on those observations to test my own models and motivate new theories, and to progress the field as a whole. As a young astronomer, I’m excited to learn as much as I can about the observing process. So when the chance to observe with a collaborator Sandy Leggett at Gemini North came up, I couldn’t pass it up! At Gemini, we actually observed from the summit (many telescopes, like Keck, actually leave the astronomers at sea level, where there’s plenty of oxygen for breathing… and thinking). At 14,000 feet, you can get altitude sickness, feel lightheaded, and generally think a little slower. But the weirdest thing is definitely this: at this altitude, even though you’re in a place with some of the clearest skies on Earth, you can’t actually see any more stars than from Cambridge, Mass. Your retinas are really sensitive to the oxygen and adapt really, really slowly when you walk out of the observatory. Crazy, right? Gemini North in the foreground; CFHT in the background. The entire side of the dome opens to allow air through; you can also see the giant cables that move the telescope, with me for scale. Sandy explained to me that this allows telescope time to be used most effectively given the conditions each night. 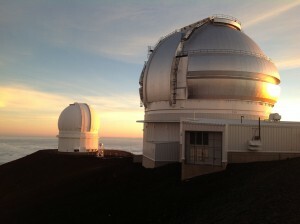 While Mauna Kea usually has great weather (that’s why a dozen telescopes are up there!) the weather is definitely better on some nights than others. The main categories of weather that effect your observations are clouds, turbulence in the atmosphere, and wind. For some observations, a thin layer of cirrus clouds might not matter. For others, you might be able to observe in poor ‘seeing’ conditions (seeing describes the amount of turbulence in your atmosphere; poor seeing will make a more blurred image than good seeing). Pointing straight into the wind may stop you from observing a target because too much wind could move or damage the telescope. Some observations may only be possible on the best nights with no clouds and excellent seeing. Each night, there will be 3-4 queues to choose from based on the weather conditions; as observers, we had to pick the best-matching queue and if the conditions changed partway through the night, switch between the different queues. This scheduling process allows the telescope time to be used efficiently. With queue observing, you never waste a clear, perfect night observing bright calibration stars; you observe the trickiest objects that need the best conditions. Likewise, a slightly cloudy night won’t be wasted trying to observe a target that really needed great weather. This setup was great for me as a student learning about observing. It allowed me to see a huge variety of observations: quasars, galaxies, comets, stars, and planetary systems. I got to use all the instruments currently installed at Gemini North: a multi-object spectrograph GMOS, an imager NIRI, a integral field spectrograph NIFS, and the adaptive optics system Altair. I gained a lot of respect for observers during my observing run. From traveling thousands of miles to get there, to staying up all night (I hadn’t pulled an all-nighter since college! ), to making decisions at 14,000 feet, observing runs can be pretty physically exhausting. I definitely needed a long night’s sleep when I landed back in California! But it was definitely worth the effort. 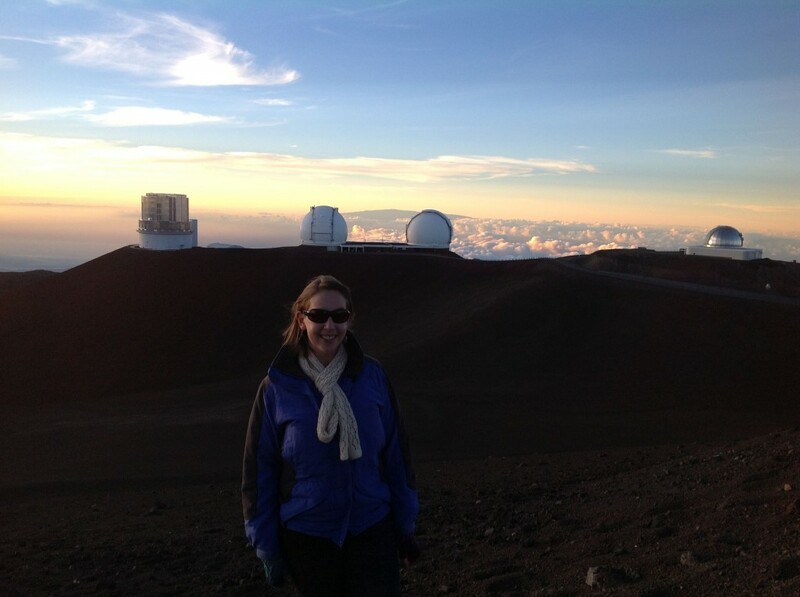 Overall I learned a huge amount in my week on Mauna Kea. I highly recommend taking an opportunity to visit a telescope, even if you currently work on theoretical projects! Have you ever been observing before? What do you think the advantages/disadvantages of queue and classical observations are? I am a third-year graduate student at UC Santa Cruz, working with Jonathan Fortney to model and characterize exoplanet and brown dwarf atmospheres. I love the personal stories on Astrobites! I somehow-or-other stumbled upon your post while idly nosing around the ‘net. As a lifelong amateur astronomer, who has also worked in the service of the professional astronomer, I have to say that an observatory is one of the most satisfying places I can find myself. These days, it’s just the small dome and ‘scopes of the Brisbane Planetarium, but given a chance of a few good hours under the Zeiss refractor, I have to ask: what more could an astro-dilettante want? In a previous life, I did a couple of years at the UK Schmidt, in the days of glass plates and silver nitrate hypering. ’twas a wonderful time. I guess by now you are working through a PhD; if so, good luck with that, and I hope you still manage the odd trip to an observatory now & then.